Increase your strength, stamina and suppleness? Improve your balance and decrease fear of falls? Have the confidence to look after your grandchildren? Live your life to the full and celebrate your 3rd Age? 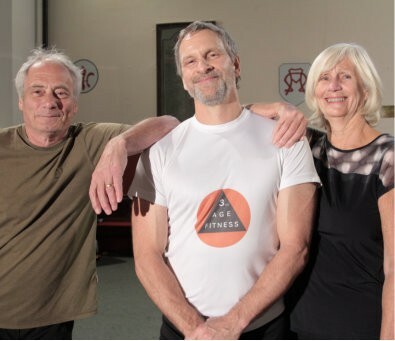 Why turn to 3rd Age Fitness? We offer strength training for older adults, personally or in classes. You work at your own level - seated, standing, active. Classes include “Aerobics for All”, “Strength Training” and “Stretching”. “Adaptations that occur during training will allow you to take your strength and balance for granted, as you feel rejuvenated”. You know you are in the right hands with your fitness training Patrick Ansley. 19 years as a fitness instructor and personal trainer with qualifications including: • Master of Arts Degree - Lifelong Learning • Bachelor of Arts - Leisure Studies • Advanced Fitness Instructor Level 3 - Adapted physical activity for the disabled person • PSI Level 4 - Exercise for the prevention of falls and injuries in older people.